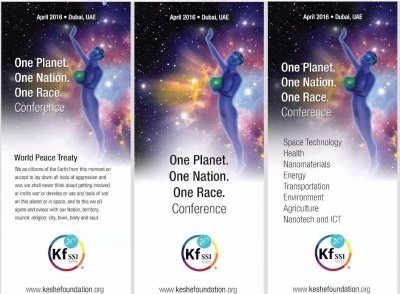 The Keshe Foundation is a scientific organization developing revolutionary technologies for space travel, health, energy, food, agriculture, animals, fauna and flora, forestry, environment, decontamination, and disaster recovery. This new Plasma Science technology is currently under development in many countries across our planet to provide affordable and simple solutions to many local problems. Many have seen beneficial results from the application of the Plasma Science Technology developed by the Keshe Foundation and you are encouraged to learn more about it. 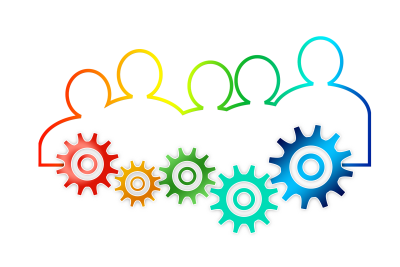 The socio-economic impact of this science is so great that it requires all nations to set aside their differences and come together in spirit of collaboration and unity so that the benefits can be equally shared and to ensure that this science is only used for peaceful purposes. For this reason all members of Universal Council have signed the World Peace Treaty that emphasizes the peaceful applications and use of this technology. On April 22nd 2016, members that have signed the World Peace Treaty and felt the inner calling to serve humanity selected themselves to represent a spoken language and the nations that speak that language. The goal is to have representatives from all the languages on the planet, in the Universal Council so we can collectively plan and decide, for the benefit of mankind, a peaceful, prosperous future for the human race and our planet to be in harmony with the Universal Community. 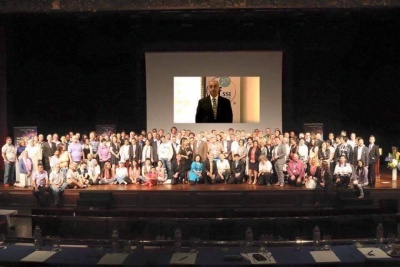 On April 21st and 22nd 2016, during "One Planet, One Nation, One Race" conference in Dubai, with the gathering of representatives and ambassadors of different nations, a seed for World Peace has been sown for the beginning of a new era for humanity. Keshe foundation through its educational network and teachings of plasma science with it's vast applications in energy, health, agriculture, transportation and space exploration will change the course of humanity for the better. We have expanded to 76 people from around the globe, more languagues are being added to the family regularly. See the contact form at the bottom of this page to apply. The family resides in 29 Countries and 14 Time zones! 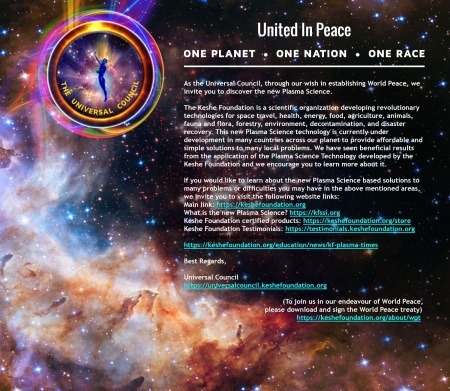 To put forth effort towards bringing the awareness of Peace to all humanity by helping to share the knowledge of the equality of souls and to share the knowledge of the Keshe technology. "The first rule of to be members of the universal council is that : The universal council member should shine like the light of the creator, to be the source of light for other souls and radiate the light of the beauty of the creator and have and try to reach all attributes of The SOUL of the creator. In time creatures of the universe see this light and not the physicality of the man. The attributes of the creator has been stated in many scriptures of the man in the past. Secondly you are through your soul a member of the council. The members of the council can't announce themselves as a member of the council unless it is announced and registered under the council’s panels and no members of the council can ever speak as themselves being a member and influencing their opinion or words, at this point immediately they lose their seat in the council and a new member can stand for the position. Those who try to show that they are better servants of humanity they do not stand a chance to take a seat in the council. Selection of the soul of the council comes from service through giving from the soul and not by talk or physical actions." This page was last edited on 2 February 2019, at 23:53.